Heading out to pickup my teenage daughter from a friend's house. Car was completely iced over and getting the door open was quite a challenge. Will post when I return on road conditions. Betting it's going to be quite bad! Current temperature 22.8° with a calm wind. CHURCH @ TRINITY ASSEMBLY in Algood will be one service only at 10:30 on Sunday morning. If you cannot make it, watch LIVE on the web site. DANGEROUS ROAD CONDITIONS: Snow, sleet, and freezing rain fell most of Friday through this morning. Current temperatures are 24° in Cookeville. We'll touch on Saturday's weather outlook in a few minutes. A quick check of measurements in Putnam County show 2.5" at Monterey to 4" in Cookeville. 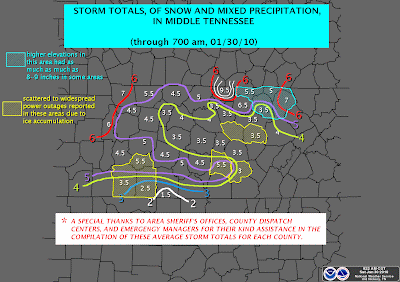 Across the state of Tennessee, we've seen as much as 7" reported in Fentress County. I'll post a map showing accumulation totals. POWER OUTAGES: Numerous power outages are being reported across Tennessee, including White and Dekalb Counties here in the Upper Cumberland. SATURDAY OUTLOOK: Currently, snow is falling again across the city and we expect to continue off and on today with another inch of accumulation possible. Temperatures will stay between the mid 20's to the upper 20's. Not much, if any, melting is expected. Tonight will be another dangerous time on the roads as temperatures will plummet to around 11° by sunrise. The temperature at Crossville tops out at 72, setting a record high for the month. Really enjoy checking in to your site to get the weather info. You do a great job! Thanks for serving our county with your reporting. Hope you enjoy this day with your wonderful family. Tell your gals hello from the Simmons. Thanks Stephen...appreciate your comments and I will definitely tell the gals hello from you all. Be blessed bro! Stephen, Thanks for your up-to-date reporting for the Cookeville area. You keep it personal for us. Blessings on this Winter day. Folks seem to be driving pretty sanely this morning - roads are decent, for now, except for Sun Valley area - took me 10 minutes to get up the hill to my driveway, it's VERY slick under that snow pack.